i think that your 'new' couch turned out great. The couch re-do looks great! 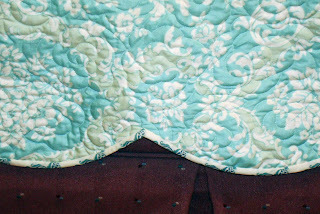 Hand sewing binding is such a bummer - I wish I could do it on the machine but I am never happy with the results. My little kid is always asking? Are we going to watch Olympics tonight? , lol... He can't accept they're finished!!!! I can't believe how much your blue coverlet looks like the original! And I like your yellow big cushion better than the original! It's all gorgeous. 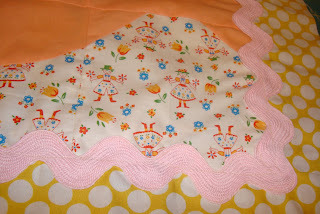 Oh and I LOVE the fabric in the first photo - the green with flowers. It 'speaks' to me!! I second what everyone else has said!! Yummy! I hope your shoulder heals quickly. 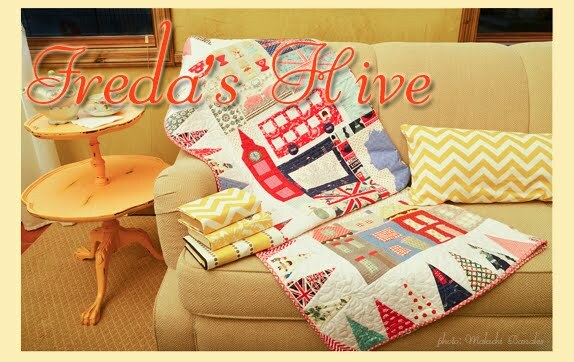 I love how your couch quilts turned out. Very nice! Your blue fabric was a perfect find. You are brave to sew slip covers. I always wanted to try it but never enough courage. Can't wait to see how they turn out. 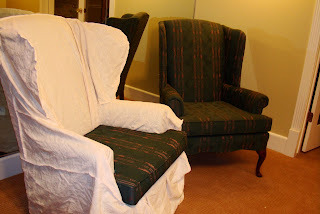 I have always wanted to learn how to make slipcovers, yes I have a couch and a few wing back chairs just like those I would love to recover. are you using a book for a reference? If so can you share the title with us? looking forward to the progress of this project and hope your feeling better soon. 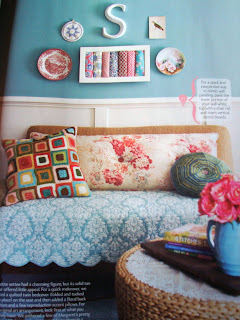 I think your couch re-do looks almost exactly like the magazine pic but even better! You inspire me! I need to move "couch re-do" up a few on my "to do" list as seeing your project makes me think I could make my tired, old couch look a whole lot better! It'll have to wait til after my retreat in October but maybe I can make it lovely for Christmas! It's beautiful Nanette! What an exciting project! Love the new couch and can't wait to see the new chairs. Your dresses are always so cute. I could never pick a favorite. And I see you used some Park Slope fabric. Another of my favorites. I have yet to tackle scallops...it keeps moving down the "things to do list". I'm sorry you're a WOUNDED soldier!! I love your couch face lift....the fabric IS fresh and comfy looking!!! Love the Couch Quilt, everything you do is top notch. 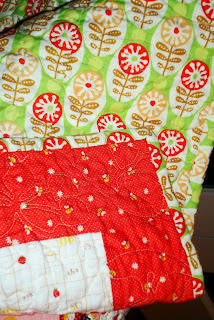 The quilt you are binding, the floral fabric is one that my daughter chose for her wedding, fun. Wow, the couch quilt looks fantastic! Your poor hands! I hope you recover soon. You prolific girl, you. I feel your pain. I work out with big elastic rubber bands. I mean BIG, not like what is around the newspaper. That seems to strengthen my neck and shoulders. LOVE the couch. That yellow and blue just makes me so happy. wish I could decide what to do with that gorgeous stuff. You should get a gold medal for all you accomplished. Your couch looks great. Great job on the new couch. The blue reminds me of a tropical ocean. Love your new couch cover!! I can't wait to see how the slipcovers turn out -- that is something I've thought of but an mowhere near brave enough to tackle. Hope your shoulder pain eases off quickly! I hope your shoulder is better soon. You have accomplished so much already! 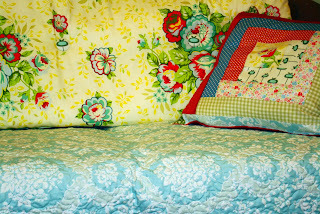 I love the new quilt for the couch, and I think it looks just like the one in the picture. Good job! You have done a great job with the couch and all the quilts. -If your shoulder is hurting the way that you should take Ibuprofen for it, heat should not be good for it. You should use cold packs instead, for 15 mins a couple of times a day. And when the pain has gone, start stretching with the BIG rubber band or a broomstick. mmmm.... more wavy bindings! 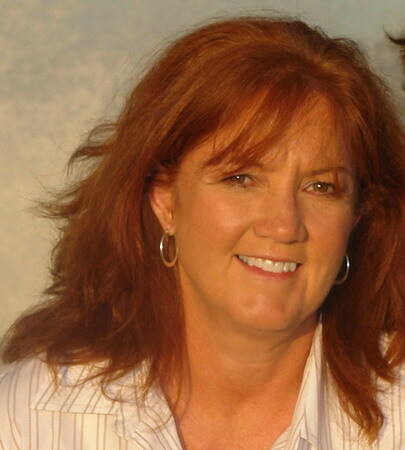 I feel like one of the Lost Boys of Neverland, Nanette - hearing tales of your fabulous Wendy! What a fabulous team you make! I love the couch re-do! I bet you will make the chairs look fantastic also. The more I see your dress blocks the more I like it. Take care of your shoulder. Love your ne couch quilt! very pretty! I'll be following your future posts about covered the other chairs. 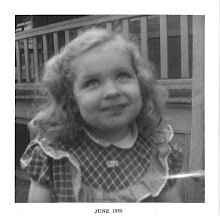 First of all congrats on your prize over at Quilter's Buzz! WOWEEE! All of your projects look great. 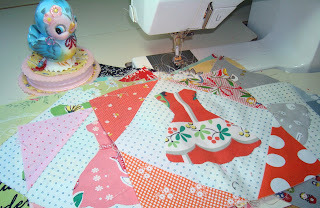 I can't wait to see the dress quilt done and that one with the Park Slope backing...mmmmmmm. The couch looks GREAT! Kinda wish I had an old couch now ;) Maybe a nice fall/winter cover for one of my COLD leather couches would be in order.... You are an inspiration. I need to get in gear. I love the fabrics you chose-the couch looks great!! Good job on the couch re do. It's very cute. I do NOT know where you find the time! You've always got some great project churned out. Can I come take lessons? Wow - I missed so much of your blog over the last couple of weeks. It has been so hectic here and I finally have had a chance to breathe. You've been busy!! Everything looks great! I have to get that recipe for the Parmesan Chicken. It looks great! i saw the couch quilt "in the flesh" yesterday. Beautiful whole quilt concept, and a great idea from one of my very favorite quilt innovators. And your sewing room! "Sew" very cute and usable. Everyone needs that tour! 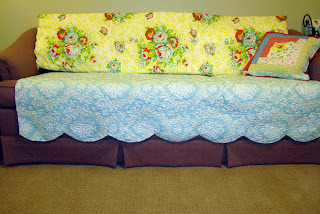 The blue coverlet is beautiful, I love the scalloped edge and the coordinating fabrics you have assembled on the couch. Definitely lives up to that pretty inspiration photo. And I love the commitment that you keep crafting even while in pain..
Scalloped edges....girlfriend, you deserve 2 gold medals. I get cold shivers just thinking about it. Your sofa looks great. What a wonderful idea. Take care and have a fantastic weekend. WOW - it's wonderful Nanette - great job and yes I can see why you've got a bit of a sore arm/shoulder - you've been on a sewing tear. But you sure got a lot done. Now take care of yourself. Oh it turned out beautiful!! Now I see how you got injured...but oh it's done and gorgeous!! love how this came out!!! Wow! busy bee you are.... It all looks great! Your "new" couch is beautiful, Nanette!! You did a wonderful job on it - it looks just like your inspiration photo, but much, much better! I LOVE your couch re-do. 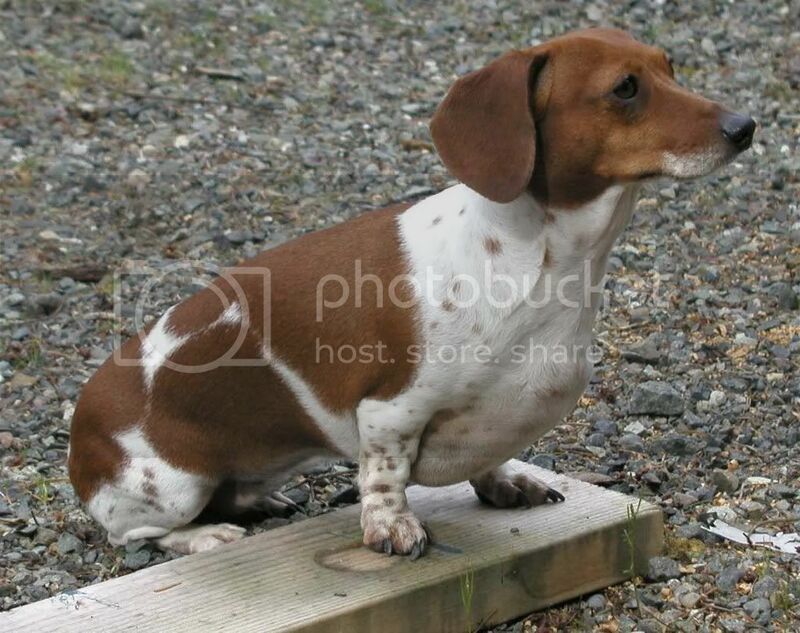 I want to try that same thing, but just over the cushions that you sit on. a few questions, though....does the quilt wrinkle and get stuck in the crease between the cushions? do you have to smooth it out several times a day to keep it looking decent? that would drive me crazy.